An interview with the staff of Tripping Magazine. From The Portrait of Doreene Gray, second in the Chihuahua mystery series by Esri Allbritten. Q: Today we’re talking with editor Angus MacGregor, writer Michael Abernathy, and photographer Suki Oota. Tripping is a travel magazine that covers destinations of supernatural interest. Is there really a market for that? Angus MacGregor: Absolutely. Given the choice between a haunted bed and breakfast and a Motel 6, who wouldn’t want the chance of running into a ghostly figure on your way to the bathroom? Q: Has that ever happened to you? Angus MacGregor: Not as such, but I’ve seen things in dark hallways that were difficult to explain. Q: Ms. Oota, before working at Tripping, you did freelance photography for Vogue, The National Geographic, and a host of other prestigious periodicals. What drew you to what can best be described as a fringe publication? Suki Oota: I get bored really easily. Hey, are those muffins over there? Q: Help yourself. Mr. Abernathy, you’re a prolific freelance writer as well as an unpublished novelist, yet none of your other work deals with the paranormal. Why do you write for Tripping? Michael Abernathy: The long answer is that legends and myths are a great window into human psychology. Also, sometimes people actually find giant squid and mysterious phenomena that are currently unknown, and that prospect is very exciting. The short answer is that Angus pays promptly. Sometimes he pays in cash. Q: Tripping Magazine’s most recent feature is about the famous portrait of Doreene Gray, which appears to age while she does not. To make things more interesting, it was painted by Ms. Gray’s twin sister. What drew you to that story? Angus MacGregor: In addition to the mystery of the painting, Doreene Gray and Maureene Pinter, her twin, live in Port Townsend, Washington, which has a host of attractions for the paranormally minded tourist. There is a haunted lighthouse and several haunted inns, stories of ghostly ships, and many excellent restaurants, not to mention the annual Wooden Boat Festival. Q: Are wooden boats more spooky than others? Angus MacGregor: Well, they’re older and often have interesting histories. Surely some of them have supernatural quirks – mysterious leaks and whatnot. Q: Was the explanation for Doreene Gray’s portrait supernatural? Angus MacGregor: You’ll have to read our coverage of the story to find out. Angus MacGregor: The plague of slugs was never explained. Michael Abernathy: It was maybe two dozen slugs. I don’t think that qualifies as a “plague,” more like an annoyance. I wonder what a group of slugs is called – a herd? A pride? I should look that up. Q: Getting back to Tripping Magazine, I think it’s fair to say you all have very different personalities. Does that ever create problems when you’re on assignment? Angus MacGregor: I’m happy to say that despite having slept in the same room, and sometimes in the same bed, we’ve never had a falling out. Michael Abernathy: Except for that one time when you almost fired me. Angus MacGregor: I did fire you. Michael Abernathy: No, I quit that time. Suki Oota: Hey, guys? Is this really the kind of stuff you want to talk about in an interview? Angus MacGregor: We’re just having a bit of fun. I’ve never fired Michael. Michael Abernathy: Not successfully, anyway. Q: Ms. Oota, do you ever feel like the odd woman out? Suki Oota: You say that like it’s a bad thing. Have you been listening to these two? Q: In conclusion, do any of you have any advice to journalists entering the workplace? Angus MacGregor: Don’t let anything get in the way of a story. If your original story doesn’t pan out, find a new one. There’s always a story. Michael Abernathy: Found it. A group of slugs is called a puddle. Suki Oota: Puddle of Slugs would make an excellent band name. Q: Readers, have you ever had any otherworldly experiences at a motel or inn? Do you have a suggestion for a town that Tripping should visit? 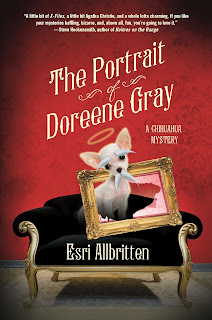 Esri Allbritten is the author of Chihuahua of the Baskervilles and The Portrait of Doreene Gray, the first two books in the Tripping Magazine mystery series (aka the Chihuahua mysteries). Her other books include Jokers & Fools, about a reluctant Tarot reader, and two romantic-suspense books written as Esri Rose and featuring elves: Bound to Love Her and Stolen Magic. In addition to sushi, bowling and marimba music, she enjoys discovering quirky, real-life towns and wreaking fictional havoc in them. 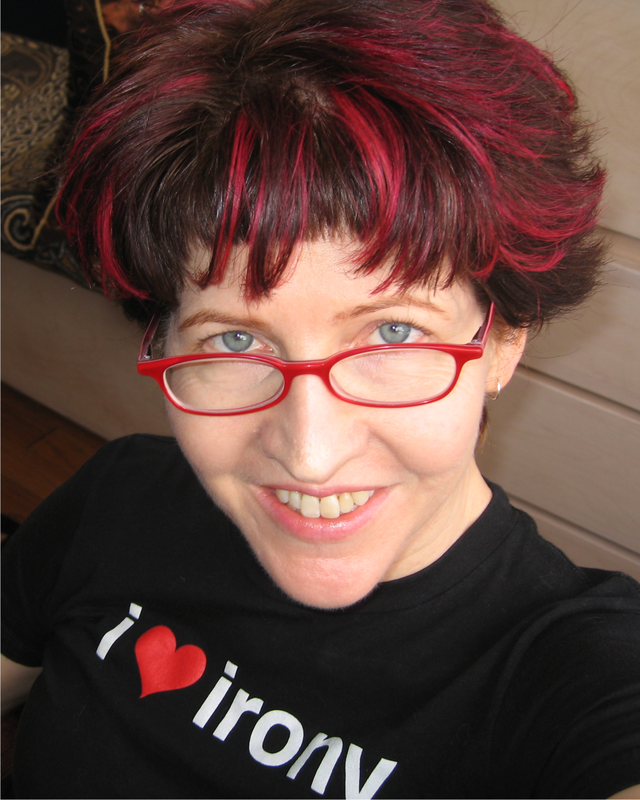 Esri lives in Boulder, Colorado with her husband, Angel Joe, her cat, Musette La Plume, and her Chihuahua, Josie O. Please feel free to visit her at EsriAllbritten.com and friend her on Facebook. This sounds like so much fun! I'd read a magazine dedicated to haunted locations. What about haunted theatres? We have one in my hometown. I'd read the magazine, too. I'm sure they'd love to write about your theater, Victoria, and travelers would like to go there. Victoria, what's the name of your town and the theatre? I'm always looking for new locations. Well, it's in Canada, so ??. This piece has a bit about the haunting aspect. i love this whole story line and have a few thoughts. I was stationed at FT Sill, located in Lawton OK....Tripping Magazine should really check out Geronimo Acres Housing.....also his grave site. In Lawton itself Wilson Elementary School has it's own paranormal activities along with Jed Johnson's Lake. Heck you could have a field day all around OK. Staying close to home, they could check out the Stanley Hotel in Estes park. Oklahoma... I'd like a reason to go there. I was with the Boulder Chamber Chorale when we sang at the Stanley Hotel. Any wrong notes were put down to unfriendly spirits.